Survival with Loot Bags mod will not only be a complex but pleasant process. Fights with mobs will be much more interesting because now cool bags fall from bad creatures. Their use will give you many useful and rare things. But first let's see what bags exist. Firstly, there are five types of bags that differ in content and in the chance of drop. In addition, there is a challenge: you need to collect all the mob heads, but this is almost impossible to do in one day. 2 heads are in a legendary bag, you will need a lot of patience to get them. 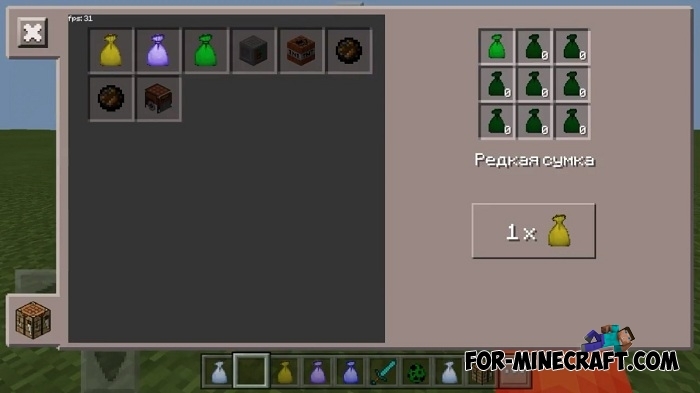 How to install the Loot Bags mod?